Is spirituality the same as religion? Or the opposite? Does it involve God? Or crystals, yoga, and Eastern Religions? Spirituality can be all or none of these depending on the person. Therefore, I prefer to define spirituality by its function in our lives instead of the practices and beliefs associated with it. 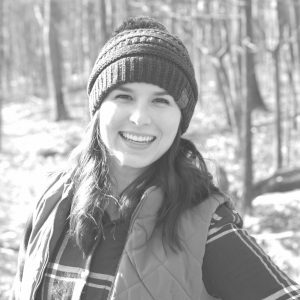 The way I see it, “spirituality is a feeling of connection to something greater, or simply, Connectedness, which is inherently desired and experienced by cultivating a relationship with oneself, one’s community, one’s environment, and one’s orientation with the transcendent” (Sarah E. K. Lentz, 2018). My research-based definition is a reminder that spirituality is a fundamental part of the human experience. Whether or not we are religious, humans have spiritual needs just like we have physical and emotional needs, and we fulfill these spiritual needs through cultivating the four relationships outlined above. No matter our religious affiliation—or resistance to religion—humans exhibit spiritual needs just like we have physical and emotional needs. Some of us fulfill these spiritual needs through traditional religions, and some of us fulfill our spiritual needs—often without realizing it—through nontraditional routes like family, sports, and/or music. The problem is, not all of us are fulfilling our spiritual needs. In response, this definition of spirituality provides a framework for improving spiritual health. In addition, its broad focus on the human experience provides common language for discussing spirituality in public spaces where religion is not always a welcome topic. My hope is that someday my definition will be used in healthcare, education, and perhaps even politics to bridge divides and collectively increase spiritual well-being. For resources on improving spiritual health, try the Connectedness Evaluation and/or read about a variety of research-based Spiritual Tools for cultivating Connectedness. Spirituality is a feeling of connection to something greater, or simply, Connectedness, which is inherently desired and experienced by cultivating a relationship with oneself, one’s community, one’s environment, and one’s orientation with the transcendent. Correspondingly, religion is a culturally-, historically-, and/or communally-situated system for responding to the inherent human desire for Connectedness and typically includes established doctrine, practices, and traditions, many of which cultivate Connectedness. In other words, humans have an inherent desire for spirituality/ Connectedness, and it is often through religion that people cultivate this Connectedness. That said, there are also many ways to cultivate Connectedness outside of religion. Check out the four Connectedness relationships and the Index of Research-based Spiritual Tools to learn more. 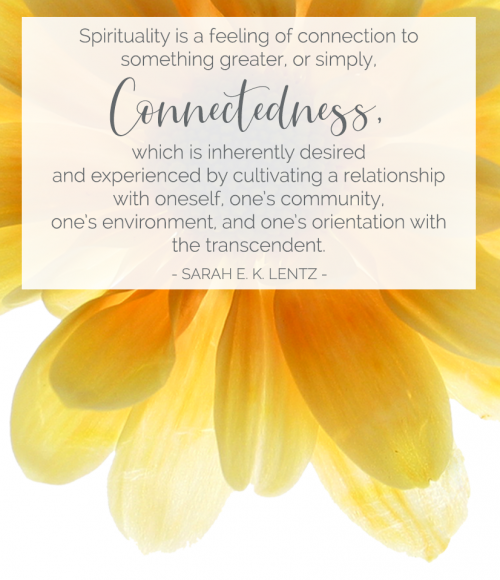 You can read about the four Connectedness relationships, try filling out the Connectedness Evaluation, read about research-based spiritual tools, follow Science of Connectedness on Instagram, sign up for email updates, or send Sarah E. K. Lentz a message. In addition, for those interested in how these ideas were formed, check out the ancestry of ideas. To read about the researchers and organizations who influenced this definition, check out the ancestry of ideas page.